This fall is upon us with the busy time of harvest, we are forever going from here to there to events that we are becoming tired and exhausted from our efforts. Many Granges have had their fairs with great success I hope. This is the end of the Big E, with busy days and rained out days. Farm Aid came to Hartford with last minute requests for help. September 30 Marcia and I celebrate 18 years of marriage. October 6 our youngest gets married in New Hampshire. This year we both will turn the big 60, and State Session is just around the corner. National Grange asked Connecticut to help with Farm Aid September 22 at the Xfinity Theatre in Hartford. Ekonk Community Grange, Winchester Grange, and Hillstown Grange answered the call and assisted National Grange in handing out fruit and talking with the public about the plight of local farmers and Grange issues. To all that attended well done and hope you had a great time. The Big E had a great year although rain washed out several days, the rest had some record breaking days. Marcia and I hold the record for ticket sales of the State Quilt chances with $507 raised in one day. Betsy Huber, National Grange Master marched in the Grange Day Parade. This year we had a float so members could ride instead of walking the whole fairgrounds. We had 12 members ride and 8 members march the entire route. Nancy Strong shared Clucky T Chicken with us by riding the trailer. Thanks to all that came out for the parade. Marcia and I had the privilege to meet Teresa Ladopoulos Mrs. Connecticut 2018. We had a great visit at the New England Grange Building and look forward to working with her in the near future. 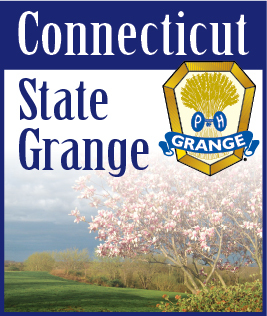 National Grange Convention is just around the corner November 7-14 at Stowe, Vermont. Jody and Jodi Ann and their team is doing a great job to make this event one that will be remembered for years to come. I wish to thank everyone who will be helping out in Vermont with the “Sound of Music” theme. It should be a great adventure. National Grange is promoting new partners for this fall, one being a cellular phone plan. We are also looking for support for new internet access for rural America. We fall into the request because Connecticut still has some dead spots for cell phone use. This is the future for agriculture as technology expands the need for internet access. We need to make it available to all at a low cost and fast speeds. Let’s not forget the days of AOL dial up internet. Our State Session is nearly here and I hope to see you all there. This is an election year so please come out and support the new officers and celebrate the end of the Grange year. This year Amanda Brozana Rios will be our National Representative. She will bring excitement and fun to our State Session. She has the knowledge of how to engage young people into our organization. Let’s give her a warm Connecticut welcome. Happy Fall and Happy Halloween. See you all in Norwich.